At the first-ever IFLA BSLA mini-congress in Berlin Germany February 23-24 2012, representatives of IFLA BSLA country projects from Botswana, Cameroon, Lebanon, Lithuania, Nepal, Peru and Ukraine shared their success stories, and solutions to challenges that cut across borders. Strategies to engage with politicians, stakeholders, and to sustain associations into the future were discussed by all association representatives and their trainers. 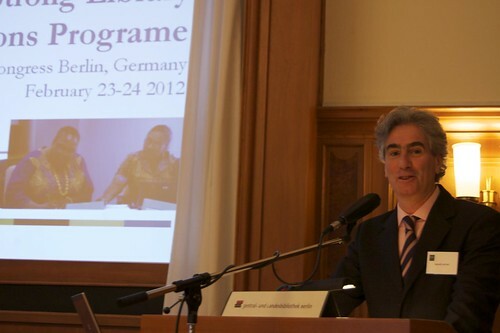 IFLA Management of Library Associations section chair, Gerald Leitner, welcomed participants and set the scene for the broader economic and societal challenges that library associations are dealing with today before IFLA ALP and BSLA coordinator, Fiona Bradley introduced the participating countries and the objectives for the meeting. Association presidents, in-country facilitators, and core trainers all took part in the meeting. 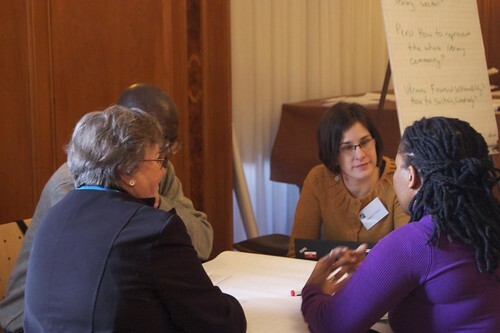 Participants took part in activities to help them assess the impact of their projects, and ideas to sustain development of associations after 2012. Reporting on their projects, associations highlighted how they have used BSLA in practice to advocate on behalf of the profession. ABADCAM (Cameroon) shared how learning from their first workshop in 2011 gave a librarian in Buea the skills to save a school library from closure. Each association also reported on increases in membership, with Botswana noting that membership of the Botswana Library Association has increased 100% since the start of the programme. CBP (Peru) has organised rallies to campaign for public library funding. Strategies to link library associations and libraries to development outcomes were the focus of a session on the Beyond Access campaign, of which IFLA is a partner. Meaghan O’Connor, of IREX, highlighted the contributions libraries already make in education, civic participation, agriculture and other development outcomes, and opportunities for further partnership. Five members of the IFLA Management of Library Associations section gave short lightning talks during the BSLA meeting, highlighting major campaigns, success stories and strategies library associations in the US, UK, Slovak Republic, Germany and internationally are taking to put libraries on the agenda. Following the BSLA meeting, the IFLA Management of Library Associations section held their midterm meeting, with BSLA attending as observers. The meeting was an excellent opportunity for participants to see IFLA in action, and to contribute ideas to the section’s strategic planning process. Further stories, outcomes, and impact from the Berlin meetings and the BSLA projects will be shared on the IFLA website in the coming weeks. IFLA would like to thank Zentral und Landesbibliothek Berlin, and director Claudia Lux; Deutscher Bibliotheksverband (German Library Association) and Executive Director Barbara Schleihagen for hosting and organising the meeting. The Bill and Melinda Gates Foundation Global Libraries Initiative for their support for the mini-congress and partnership in the BSLA programme in Botswana, Lithuania and Ukraine. IFLA MLAS, IREX, and BSLA colleagues for their participation in the meeting. More information about the Building Strong Library Associations programme is available on the IFLA website. Photos from the meeting are available at IFLA’s Flickr profile.